Shown here are various shrubs to help bring color and beauty to your yard most months of the year. 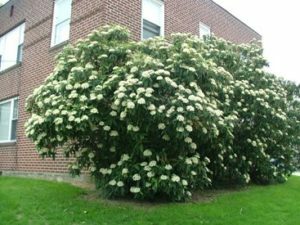 Scroll down on this page where there are brief descriptions and photos of different varieties of top flowering and evergreen shrubs and bushes that we plant, and consider the best performers in this area. 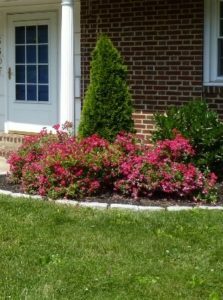 We use many other shrubs and bushes not shown here, and if you have a favorite shrub it normally can be used in our designs. Additional Photos of Trees, Shrubs, Perennials, Bulbs, and Annuals can be seen in various albums on my facebook page. Arborvitae: Many varieties of mostly large shrubs or small trees. Upright evergreens on the narrow side, commonly used as a screen along the property line. 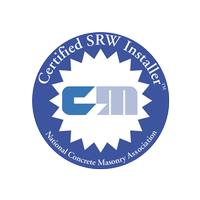 Could also be used near corners to frame a house. 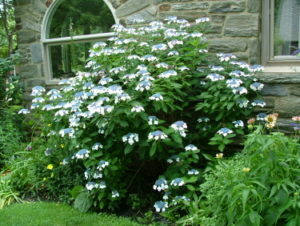 “Green Giant and ‘Elegantissima’ grow taller and can usually be found as single stemmed plants. 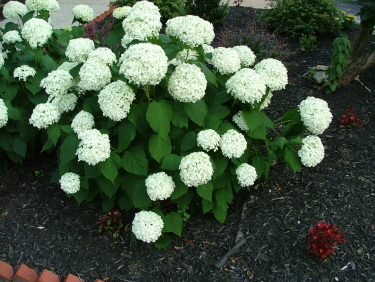 ‘Emerald Green’ is shorter and ‘Nigra’ a medium grower are harder to find as single stemmed plants. Single stem plants hold up better long term. While multi-stemmed plants are easier to grow to sellable size, they can split apart as they get older. 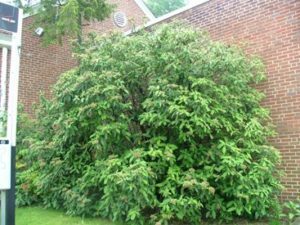 It may take 15 or more years before it becomes a problem, but we try to select the best plant for long term growth. 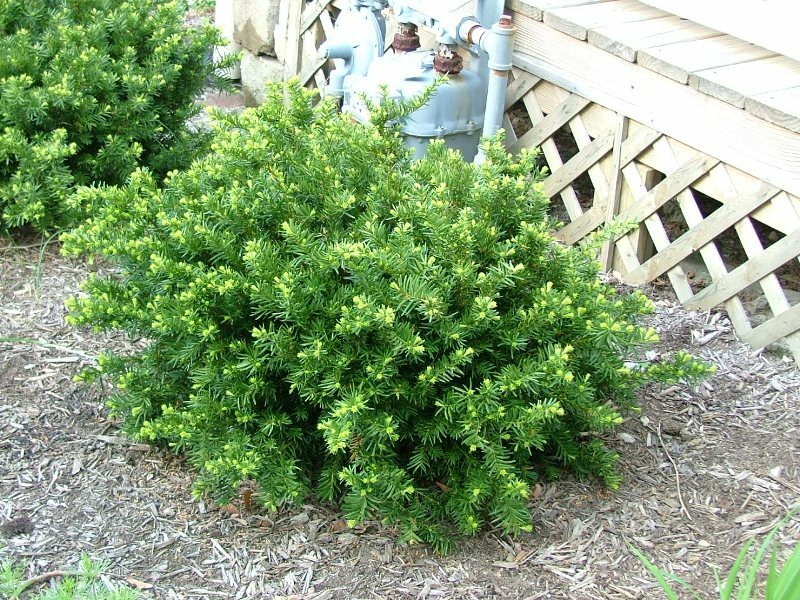 Smaller shrubby types can be nice filler plants but they can also have splitting problems. 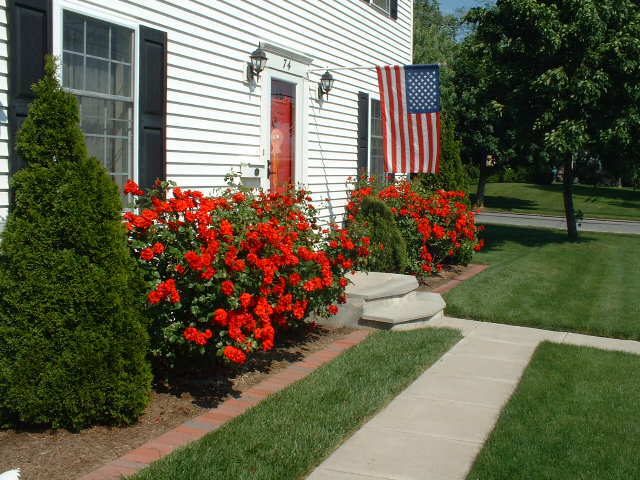 They will grow nice in the sun and they do ok in some shade. 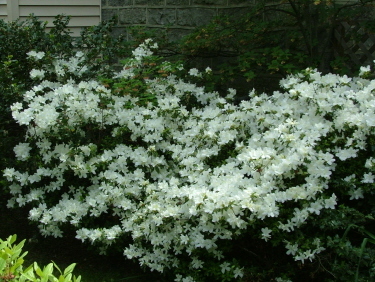 ‘Nigra’ – A very popular variety for screening. 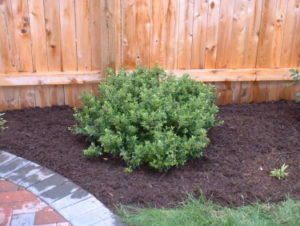 Medium height and width with a nice green color. 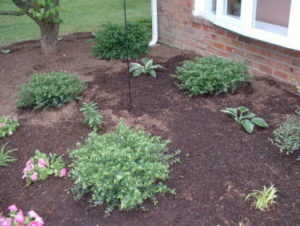 We look to plant single-stemmed plants, which can be harder to find, for long term health of the plant. 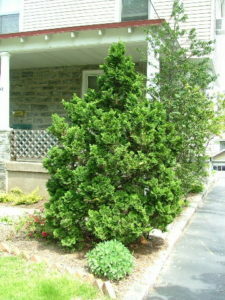 ‘Emerald Green’ – A lower, narrower, darker green variety. 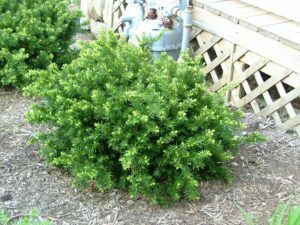 Good for a shrub border, but doesn’t get as tall as the previously mentioned varieties so I don’t feel it is as good a plant for screening. 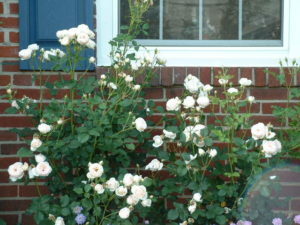 Single stemmed plants again are better for long term health. 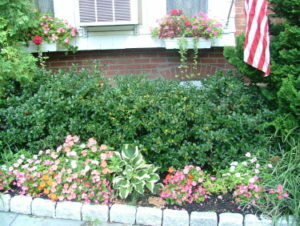 Notice the three tops on the plant on the left. That could lead to future problems. 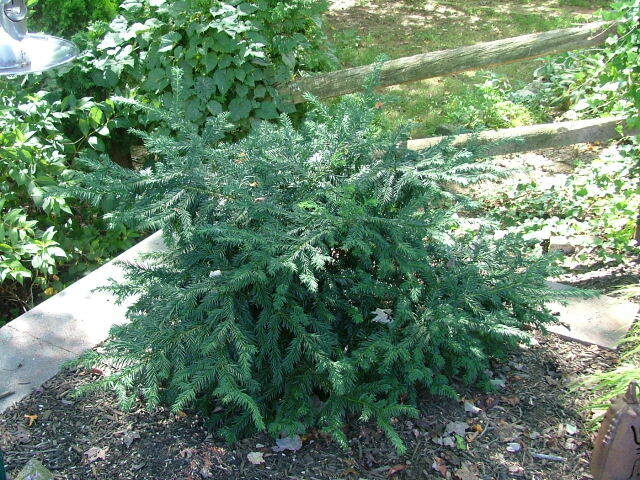 Hinoki Cypress: Originally a forest evergreen but now there are some varieties that only get 2-ft. tall. Many different varieties. Some grow faster and taller than others. ‘Gricillus’: a narrow upright form of Hinoki Cypress that can grow to 12 or more feet. 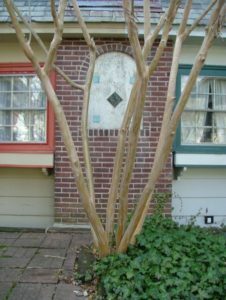 Could be used at the corner of a house to help frame the house. 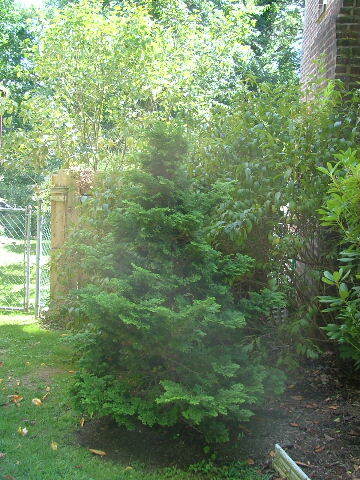 Dwarf Hinoki Cypress: Slow growing interesting evergreen. Foliage grows in a little of bunching way and that gives the plant an interesting growth habit. 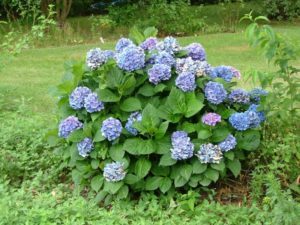 Dwarf varieties grow slow, so plants can be expensive. 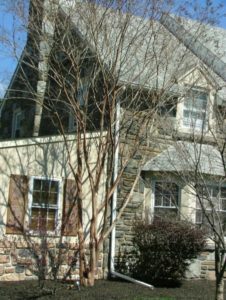 Can take some shade but growth will be thinner. 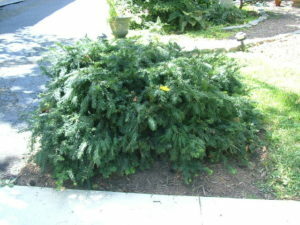 Yews: Not deer resistant -Needle evergreen commonly used as a hedge plant. Dark green foliage. 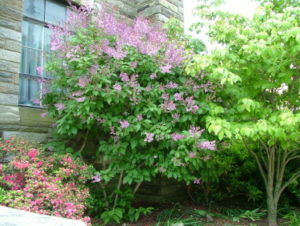 There are many varieties with different heights and growth habits. 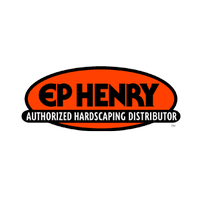 It is important to choose the right variety for the use you have in mind. 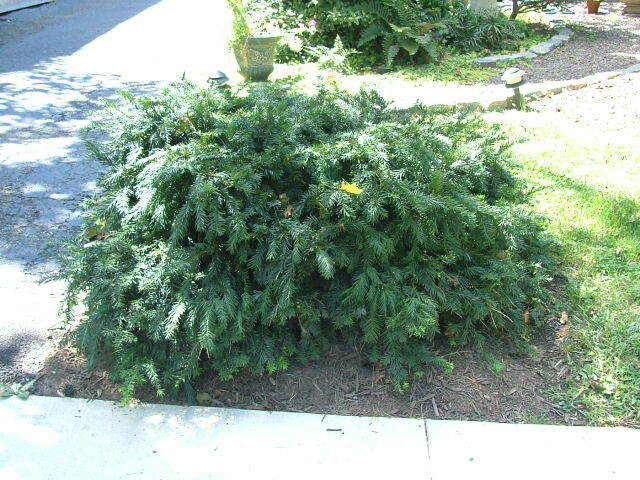 Densiformis yew: Low to medium growing evergreen. Commonly used as a hedge plant. Good in the shade. 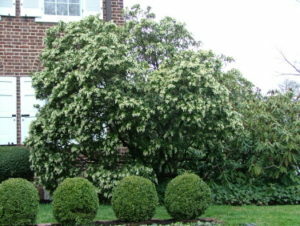 Generally should be pruned every year to keep its dense shape. Dwarf English yew: Nice habit with branches layering horizontally over existing branches. 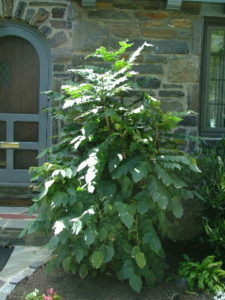 This plant will get wider than it is tall. Doesn’t need much pruning if it is planted in a location where it can spread out. Gains height very slowly. (only 3-ft. high after 10 years – might get 6-ft. tall after 50 years). 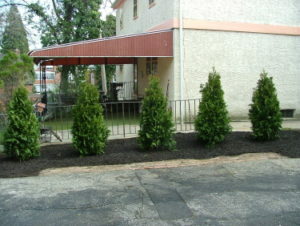 Nice dark green foliage. 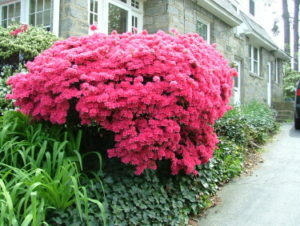 Holly: Besides tree types of hollies there are may types that are used as shrubs. 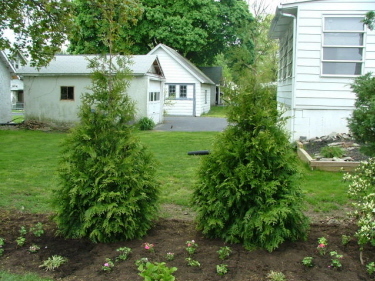 Like Arborvitae there are many varieties that can be used as small trees or large shrubs. 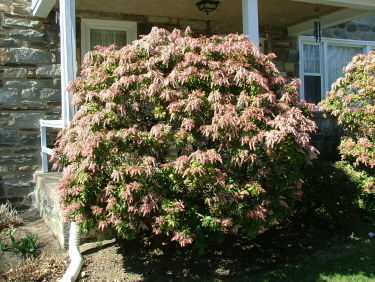 Many of the female varieties have nice red berries in winter. 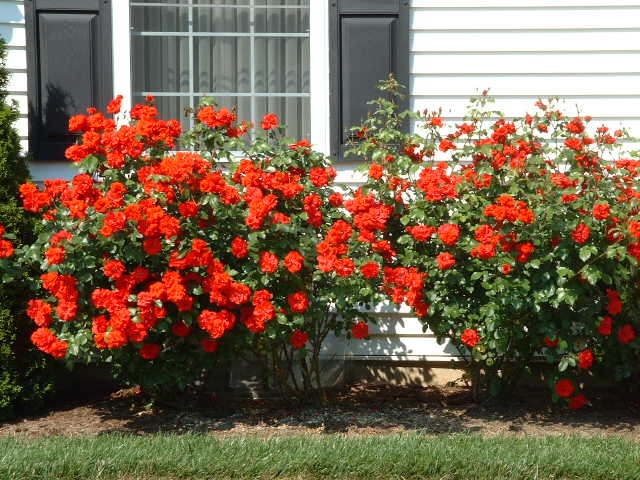 (They need to be pollinated by male varieties.) 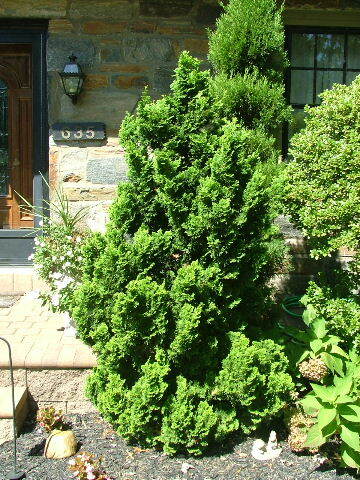 There are nice narrow upright varieties such as Fosteri with narrower than usual leaves, and the even narrower Dragon Lady with shiny dark green pointy leaves. There are medium growing varieties such as the Meserve or Blue Hollies with very dark green pointy leaves, and the paler green China Boy and China Girl. 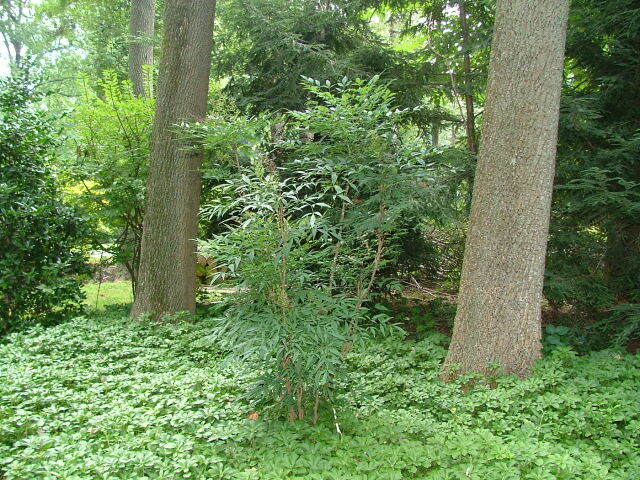 The Japanese Hollies have smaller and smooth edged dark green leaves, and the female varieties usually have black berries. They also come in all shapes and sizes with some varieties such as ‘Hoogendorn’ and ‘Helleri’ staying lower than 3-ft. tall. 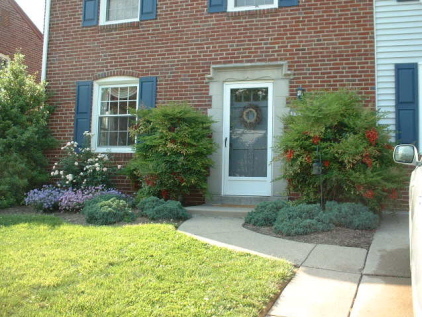 Hollies like sunny locations but can tolerate a surprising amount of shade. 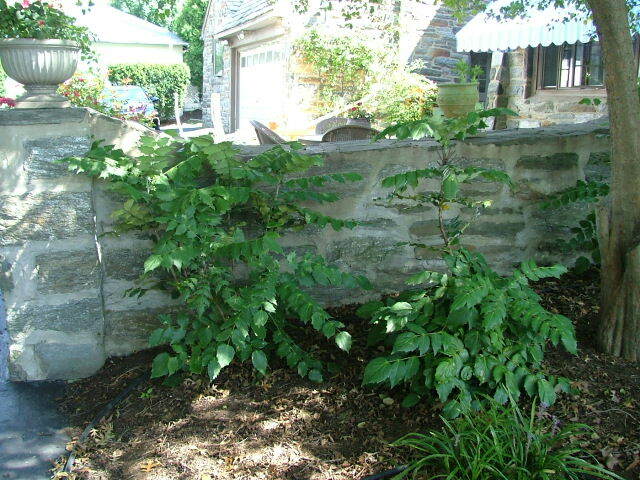 In the shade they grow a little looser and do not fruit as heavily. Blue Hollies planted as a hedge. The center of the hedge is a yellow fruited variety. 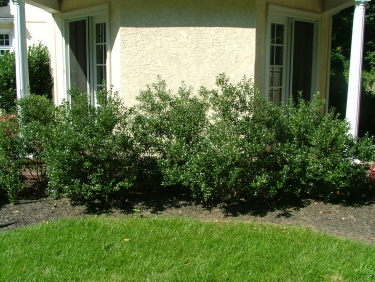 Inkberry Holly or Ilex glabra – Can get leggy on the bottom. Compact varieties have a better habit and grow to about 4-ft. Has black berries and can tolerate wetter soil than most shrubs. 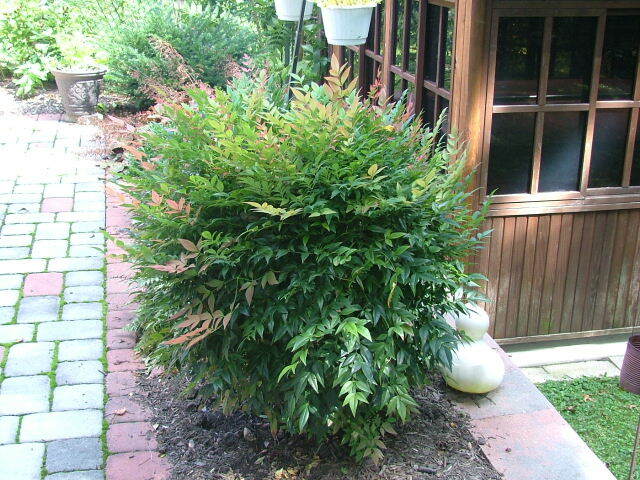 Nandina: also called Heavenly Bamboo. 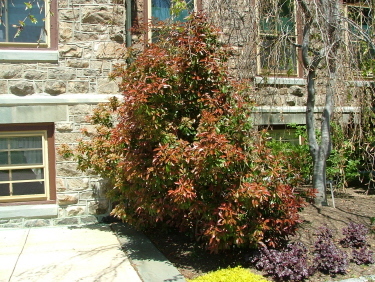 A multi-stemmed shrub with small evergreen leaves that can turn reddish in fall and winter, and an interesting fine texture. 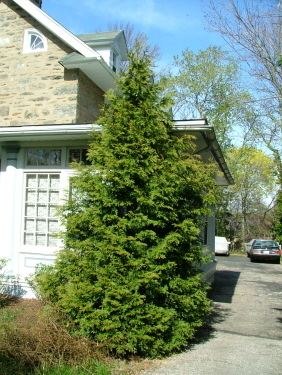 The can get about 6-ft. tall and wide. 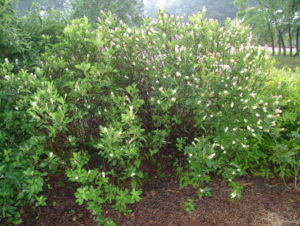 The have small white flowers in late spring and very colorful bunches of red berries during winter (the berries are also long lasting when cut and make nice decorations at Christmas time). There are also varieties with plum colored foliage and dwarf varieties that are nice, but these varieties don’t seem to get berries. Nandina ‘Gulf Stream’: A good dwarf variety that develops a nice red leaf in winter. 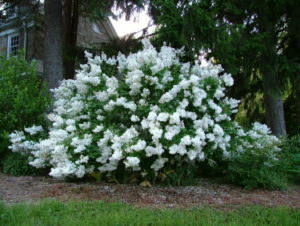 Grows to about 3-ft. high and wide. I have not seen good berry production on this plant. 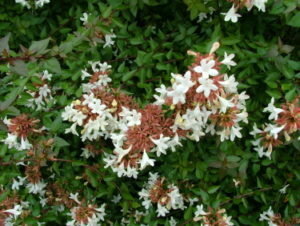 Abelia Semi-evergreen shrub about 5 to 6-ft. Small white to pink flowers all summer. 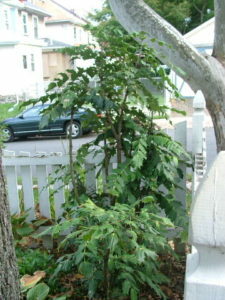 Mahonia: also called Grape Holly. 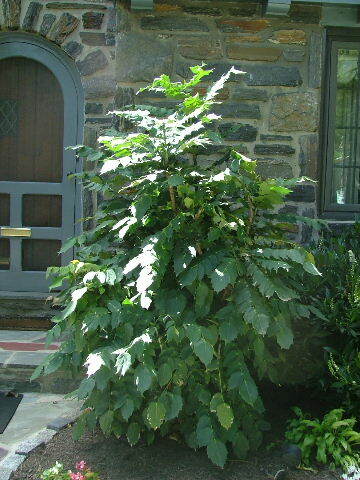 This plant has very pointy dark green holly-like leaves. 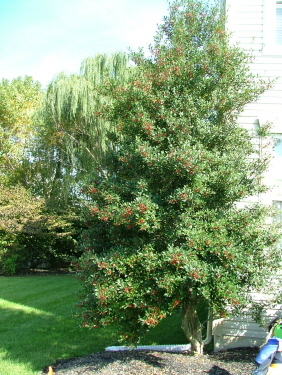 The leaves are larger than Holly leaves giving it an interesting course texture. 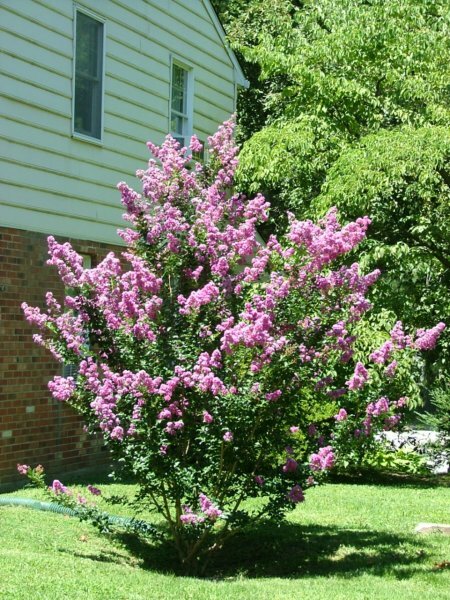 It can take a lot of shade, and it is usually a multi-stemmed shrub that could grow to about 6-ft. slowly and can be easily kept at a lower height. 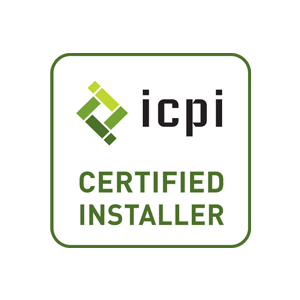 It is open enough to not give the feeling of a complete screen. 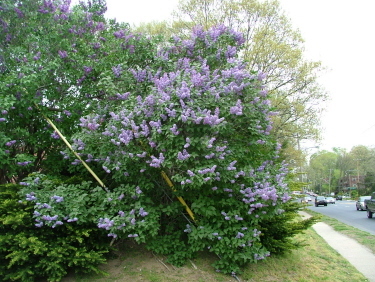 It has small yellow fragrant flowers in late winter and blue berries in early summer that are quickly eaten by the birds. 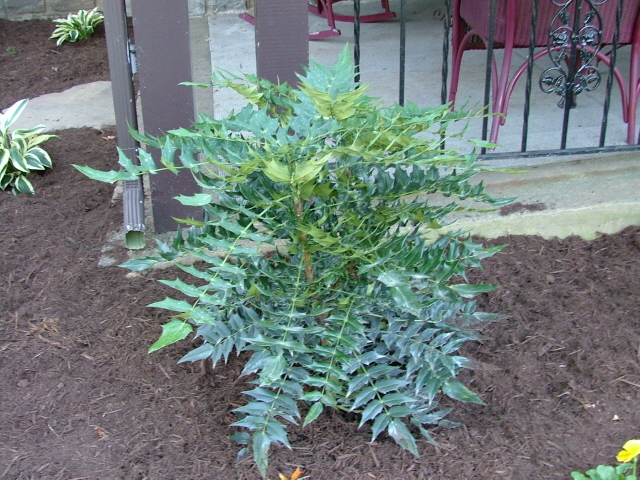 Mahonia ‘Winter Sun” – Said to grow a little taller than Mahonia beali and Mahonia media and have larger flowers in late winter/ early spring. Flowers though larger are said to be not as fragrant. Evergreen Viburnums: Similar in texture to a Rhododendron, but a faster growing evergreen. 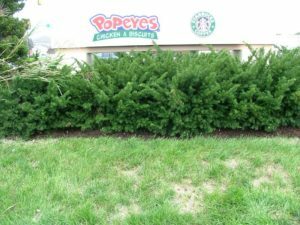 Good as a screening shrub to hide or separate. Can get berries with proper pollination. Other deciduous Viburnums can be seen below. 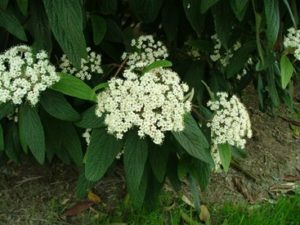 Leather Leaf Viburnum in spring with flowers. 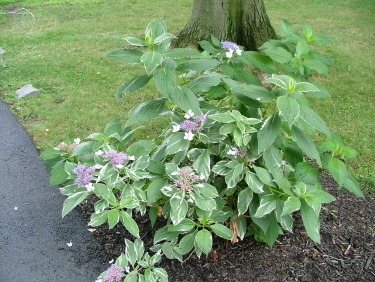 Close-up of Leaves and flowers. 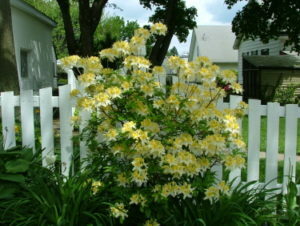 Azaleas are shrubs (usually low growing – 2 to 4-ft.) that bloom in mid spring. 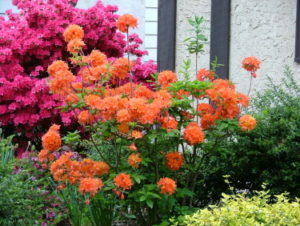 Azalea are very colorful plants that bloom for about 2 weeks. 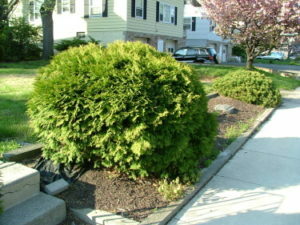 Some varieties have attractive evergreen foliage that looks nice year round. Azaleas come with flowers in white, pink, red, and purple. 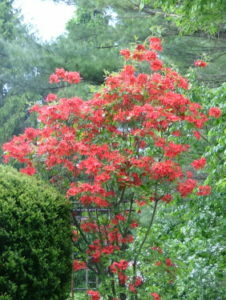 Deciduous varieties also come in orange and yellow. Azaleas like acid, well drained soil. 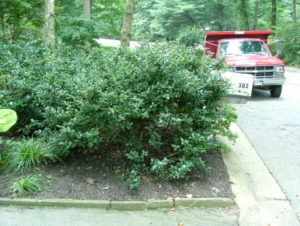 Soil near house foundations often are heavy clays that hold water and can cause azalea roots to rot. 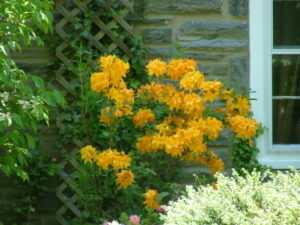 Deciduous Azaleas come in some different colors than the evergreen azaleas. Some varieties are very fragrant and can bloom for over 3 weeks. They generally are more upright than other azaleas. 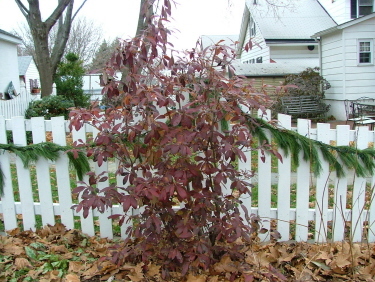 They loose there leaves in winter, but some varieties get nice fall color. 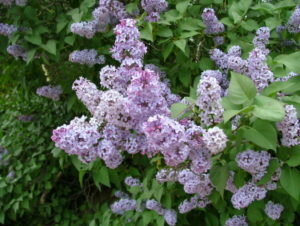 Lilac – Upright shrub, old fashion favorite – can be leggy, very fragrant flowers in spring. 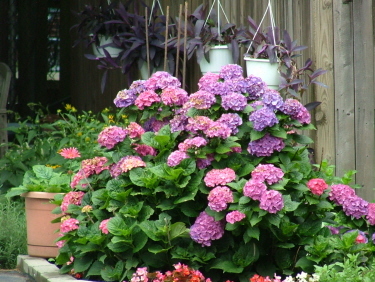 Other varieties with different habits and flower types are available. 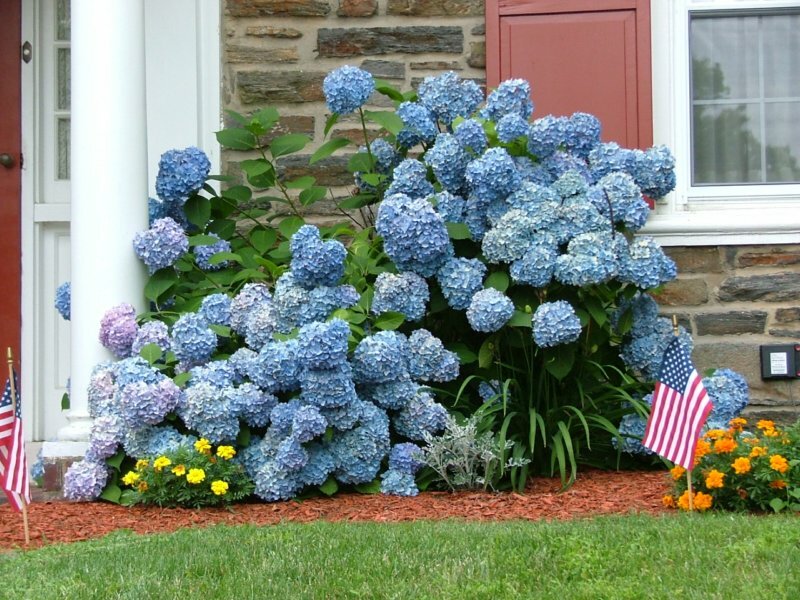 White, blue, purple, and maroon. 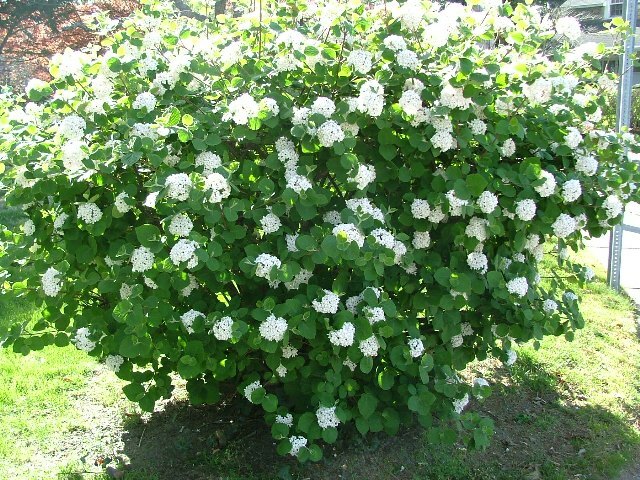 Viburnum carlesii – Very fragrant deciduous shrub with white flowers in May. One of the best of any plant for fragrance. Other Viburnums are available with different main attributes such as colorful berries, evergreen leaves, and larger flowers. 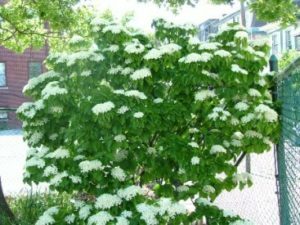 Viburnums for berries: There are a few different types that have great berries in the fall. 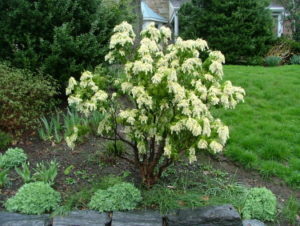 The flowers are interesting but not as showy as some of the other Viburnums. 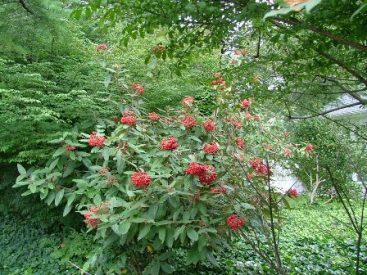 Viburnum dilatatum in fall with berries. Viburnum dilatatum in spring with flowers. 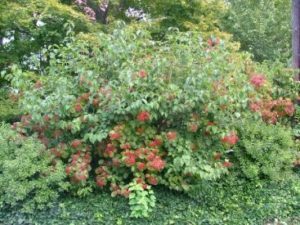 Viburnum in fall – I believe this is a Tea Viburnum. 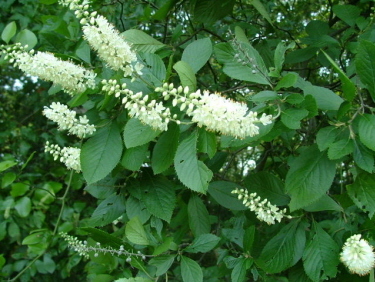 Clethra – Fragrant flowers in summer. 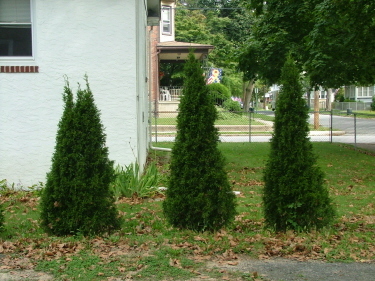 Bushy plants 6-ft. tall. 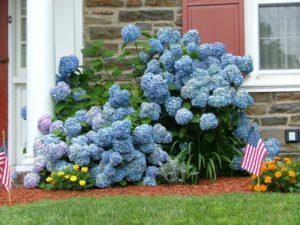 Hydrangea – Flowers in summer. 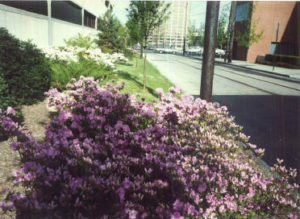 Pink, blue, or white. 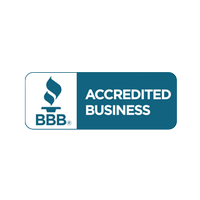 Different types available. 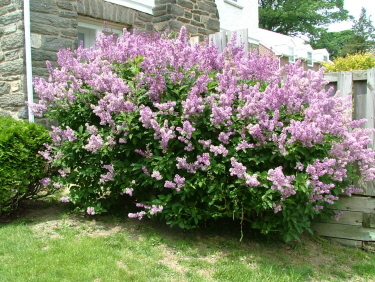 Can bloom for a couple of months in early summer – longer than other most other flowering shrubs. 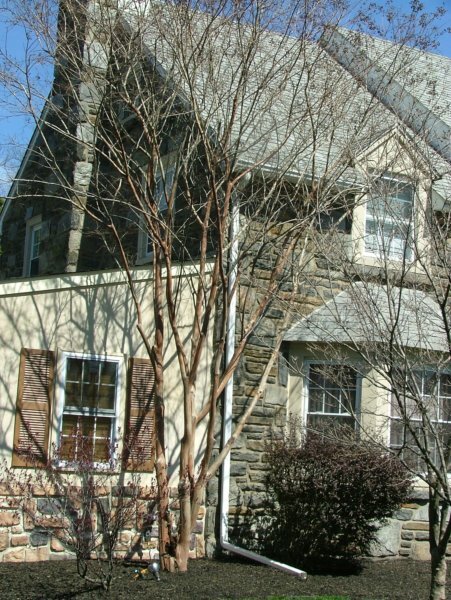 Takes a little shade. 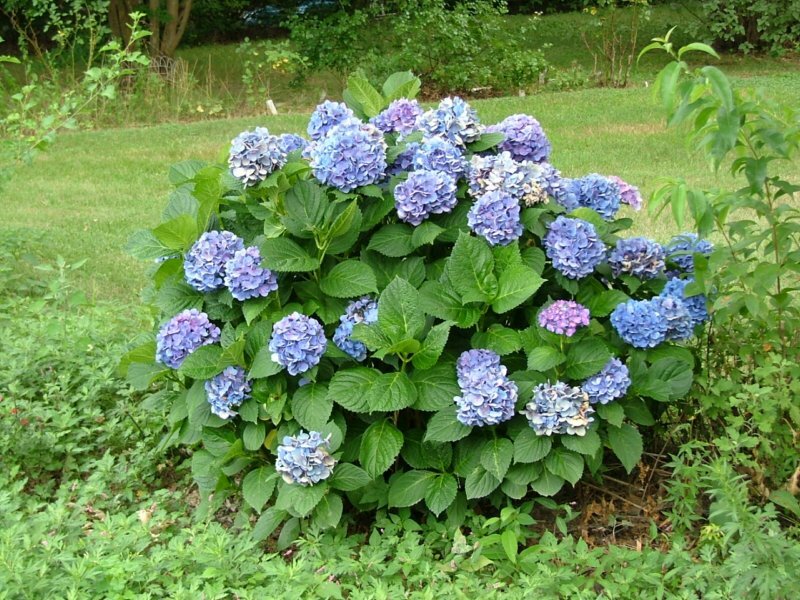 Flowers blue with acid soil, pink in alkaline soil, also comes in white varieties. Grows about 3-ft. high and wide. 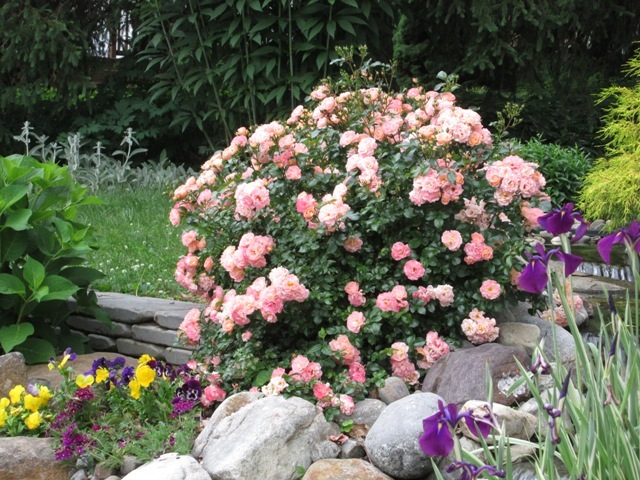 Drift Roses: Low growing and low maintenance landscape type roses; small flowers but large number of flowers on each plant make this my favorite shrub in my yard.These roses will bloom off and on right up until frost. 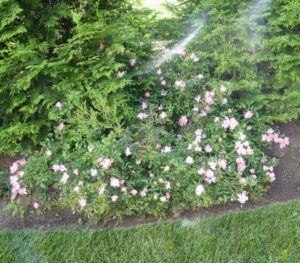 Resists deseases, including black spot. 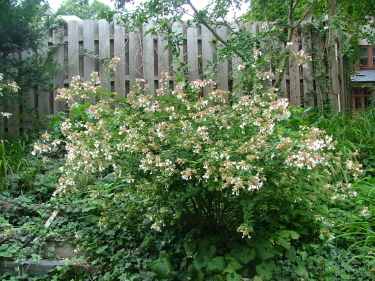 It could posibly be bothered by deer, but unless you have herds in your yard every day, I think it is worth the risk. There are a number of different varieties and colors. 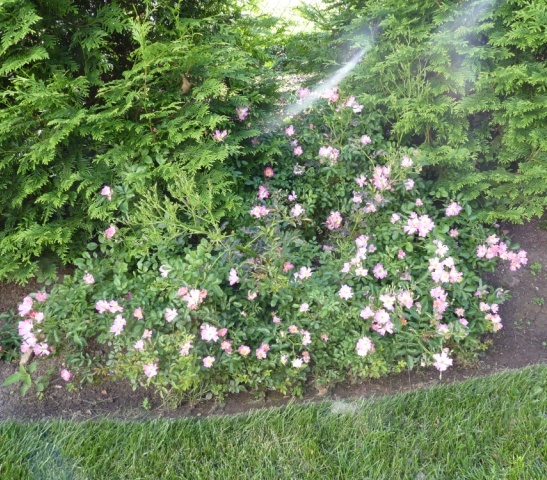 Pink Drift Roses, Smaller, light pink single flowers. Red Drift Roses, Smaller semi-double flowers. 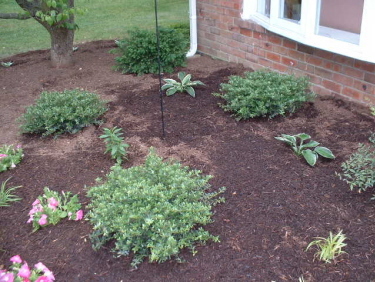 Plants seem grow lower than other varieties. Peach Drift Rose: Nice clusters of double flowers. 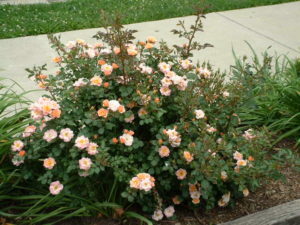 Coral Drift Roses have a more intense color, but peach is the only drift rose that I noticed had a fragrance. My favorite so far.